They don't just look good, they taste great too. Bruschetta, pronounced broos-khet-a is the Italian word used to describe long slices of toasted bread rubbed with garlic and sprinkled with olive oil. But today, bruschetta is known as a larger version of crostini — a toasted bread with a wide variety of toppings. 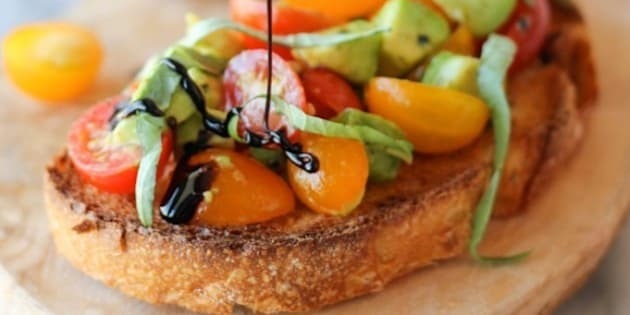 In the slideshow below, we look at 28 of our favourite bruschetta recipes. Some are sweet, others savoury, but all are absolutely delicious. We know what you're thinking — how hard can it be to top your toast with a few ingredients? Why would you need a recipe? Well, it's not as simple as it seems. If you've whipped up bruschetta on a whim, you've probably wondered why it always tastes like individual ingredients pieced together instead of one delicious bite of harmonious flavour like you get in restaurants. The secret is time, specifically: “Day-old bread, month-old oil, year-old wine," the Telegraph reports. And if you still aren't convinced you need the recipe, you can always just look through the slideshow below for flavour inspirations. What's your favourite toast topping? Let us know in the comments below.